I was stood in front of 50 farmers in an un-airconditioned one-room K-12 schoolhouse in Espinal, Tolima, central Colombia. I had been explaining how to leverage international supply chains to reach lucrative foreign markets. But this one question shocked me. The woman who asked it had depended on this pricing system her entire life, but no one had ever explained to her how it worked. I hadn’t thought to explain it, because I couldn’t imagine that this information gap existed. But it does – and not just in Latin American farms. As everyone sweated and my colleague pointed at his watch, I asked the intern for all the white-board marker colors she could find, and launched into a spontaneous microeconomics lecture. Over the next hour we explored supply and demand curves and price elasticity, and a dozen farmers passionately engaged themselves in the conversation. This is something that farmers need to know, that importers/exporters need to know, and that consumers need to know. 25 million smallholder farmers are made vulnerable by the fluctuations of the coffee market, and it’s our responsibility, as ethical consumers, to be aware of this when we purchase our drinks. So let’s look at the three factors affecting the global coffee price. The price of coffee changes every minute like stock – or any other commodity – does. It’s defined by commodities exchanges, including the Intercontinental Exchange (ICE) in New York, which is the most important for Arabica coffee and which sets what’s called a C-Price. And, like any other exchange-traded commodity, stock, bond, currency, etc., this C-Price is defined by supply and demand. If there’s little coffee available, the price goes up to the point at which supply exactly equals demand. Some people that had wanted coffee will decide not to buy as the price goes too high for them. The price will then stop increasing when the remaining people who are willing to pay want the precise quantity offered. If there’s a lot of coffee available, however, the price will fall to the point at which it’s all sold. So there’s more available than people want that day but, as the price drops, they decide to buy more to take advantage of a good deal. The price stops dropping at the moment that people agree to purchase precisely the quantity offered. This tendency for demand to change as price changes is called price elasticity of demand (PED), and it’s the market’s unique price sensitivity. Dusk at the top of Colombia’s Western mountain range, over 2000 m.a.s.l. The future of the farmers here depends on the fluctuations of the coffee market. Adding to the complexity are financial derivatives, such as futures contracts, which are promises to purchase at a future date at a price determined today. Sound easy? It’s about to get a bit more confusing. The agreed-upon price is based on the predicted price (which in turn is based on supply and demand) at the delivery date when the contract expires. Because of the derivatives market, predicted supply and demand for coffee is built into the C-Price. For example, if people think the C-Price will increase in the future due to supply and demand conditions, such as a weak harvest in Brazil, they’ll start buying futures contracts today to sell for a profit when and if the price increases as the delivery date approaches. That increased demand for coffee contracts will cause the current price to go up. The reverse is also true. If there is speculation that the price will drop, people will start selling their coffee and futures contracts or purchase short positions. This decreased demand will cause the current price to drop based on future speculation. How much are these beans worth? That’s a complex calculation. Credit: Isai Symens via Wikipedia. Coffee derivatives are used as a hedge by industry actors and as an investment by speculators. So what does this mean? Well, to “hedge” as an actor in the coffee industry is to purchase a financial product based on the price of coffee at some point in the future. You do this to safeguard yourself from a change in price ahead of payment, delivery, or harvest. Hedging is an important element of modern finance and allows the commodities industry to function. For example, a green coffee importer makes a deal with an exporter in an origin country to purchase 17 tons of green coffee at C-Price+10 cents per pound. That coffee won’t be delivered for 3 months, so if the C-Price rises between today and the delivery date, the importer owes more. Let’s look at how that works in practice. This importer buys a 3-month future contract to essentially lock in today’s price. If the C-Price goes up in 3 months, she buys the coffee at the higher price and sells her future contract for a profit, offsetting the increase on what she spent on coffee. If the C-Price drops, on the other hand, she buys the coffee cheaper than expected and sells the future contract at a loss. In either case, she gets the coffee for the price of the day that she made the agreement. The purchase of this hedging instrument is indicative of real demand for coffee, and therefore contributes to the logical C-Price movement based on real supply and demand. However, anyone can buy financial instruments based on the C-Price, not just those involved in the physical trade. 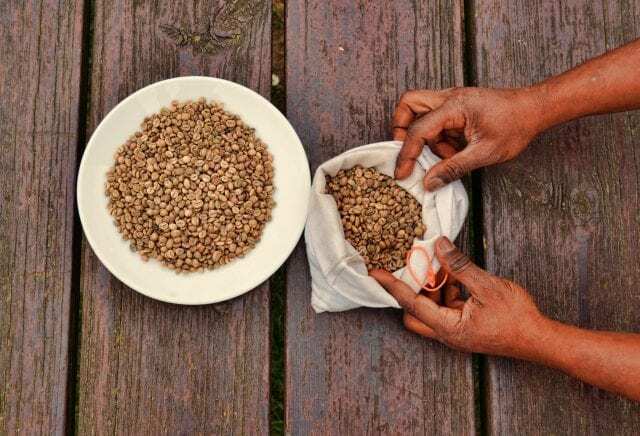 Speculation without the desire to ever buy or sell physical coffee, which is about 90% of the futures traded, also affects the C-Price based on the supply and demand for futures. The large volume of futures traded can cause price inertia or more extreme price swings than would normally occur based purely on the physical product. 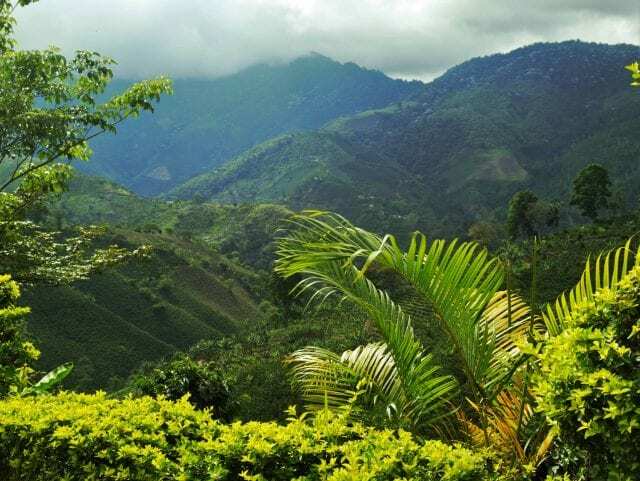 Sunshine breaks through the rain clouds to shine on a coffee farm in the Colombian Eje Cafetero. As a financial market, this is all part of the game. However, in practice, there are two flaws with this system. The first is that, while the industry is able to hedge market volatility to an acceptable level of risk, most of the 25 million small farmers that produce 80% of the world’s coffee do not have that capacity. This leaves farmers the most vulnerable to price fluctuations while the least able to weather them. Secondly, there is no formal consideration for specialty-grade quality coffee – but that’s a large topic deserving of its own article. Coffee has always been a boom and bust market, susceptible to bad weather, pests, and civil strife. The way that it’s purchased only makes it more unstable. Written by K. Wienhold, Founder of Direct Origin Trading and edited by T. Newton & Fulanito Gonzales.